Caution: Norris’s love of all things Greek is rhapsodic (from the Greek rhapsōidia, to sew [songs] together), encompassing language (both ancient and modern), history, mythology, scenery, and ouzo, and it’s highly contagious. Sail with her to Greece and the Greek islands, visiting familiar and obscure sites and taking abundant side trips to other aspects of her life as an endlessly curious student, autodidact (also from the Greek), and copy editor at The New Yorker. You’ll begin planning your first or next trip to Greece before you’re halfway through this exhilarating book. Greek to Me is a charming account of Norris's lifelong love affair with words and her solo adventures in the land of olive trees and ouzo. Along the way, Norris explains how the alphabet originated in Greece, makes the case for Athena as a feminist icon, goes searching for the fabled Baths of Aphrodite, and reveals the surprising ways Greek helped form English. 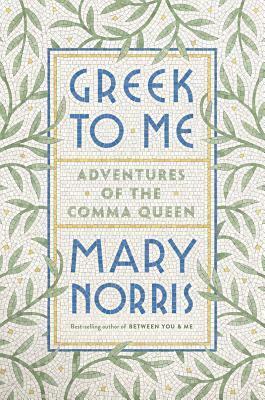 Filled with Norris's memorable encounters with Greek words, Greek gods, Greek wine--and more than a few Greek men--Greek to Me is the Comma Queen's fresh take on Greece and the exotic yet strangely familiar language that so deeply influences our own.